So you run a service business and you want to grow your service business so that you make more money and work more efficiently. You have technicians in the field all over the place, and you want to keep track of them. You have Inventory in your warehouse and you want to know how much product you have on hand at any particular time. You need to calculate your payroll. You need reports about your accounting and how you are doing — this month or this year. The best way to grow your service business today is with field service management software. It will streamline your business and revolutionize your business like nothing else can. And the best field service management system to grow your service business is with FieldSurf. FieldSurf totally automates every aspect of your service business and brings it into the 21st century. Let’s take a look at FieldSurf’s field service management software and its amazing features and how it can help you grow your service business. A huge problem in any service business is knowing exactly how much inventory you have on hand at any particular time. With FieldSurf, you always know exactly what Inventory you have on hand at any given time. When an item arrives in your warehouse, you enter that item into FieldSurf’s Inventory module. It includes the item’s product barcode, a picture of the item, and the number of items you are adding to your inventory. Every time a technician takes an item from your warehouse and places it in his vehicle, FieldSurf makes a note of that. Then, when the technician sells that item to your customer, the item appears on your Invoice and your Work Order, and the sale is automatically deducted from the number of items you have on hand. Using FieldSurf’s inventory module, you always know exactly how much inventory you have, and you also know how much inventory each of your technicians has in his vehicle. When you get to a predetermined level, FieldSurf will notify you. That way, you can reorder before you run out of product and if you use FieldSurf, it will tell you how much product you will need for the next period, so you don’t have to tie up money in product you will not be needing for a while. And all FieldSurf’s inventory information is generated for you in real time, so it will reflect even the sales you just did today. Nothing manages Inventory control like FieldSurf. One of the major features of FieldSurf is the way it streamlines your scheduling and dispatch functions. At a single glance, your dispatchers can immediately identify which time slots are free and which are booked. FieldSurf prevents double-booking, because it will not permit any of your schedulers to book a time slot or book a technician who has already been booked elsewhere. FieldSurf’s GPS “Geofencing” feature shows your dispatcher on a map exactly where each of your technicians is at all times. When a new call comes in, your dispatcher can easily see which of your technicians is the closest to the new call, and your dispatcher can then dispatch accordingly. This makes for far greater efficiency — if you have a tech in Orange County and another one working in Malibu, when a call comes in from Santa Monica, the dispatcher can easily see on the GPS map that the tech in Malibu is the closest to the new location, and will dispatch the tech now working in Malibu, rather than getting the guy all the way in Orange County to make the trip. FieldSurf makes for major efficiencies in scheduling and dispatching your field technicians. Another major feature of FieldSurf is it’s Inventory control function. Available in the Enterprise version of FieldSurf, FieldSurf’s Inventory control feature lets you stay on top of your inventory at all times. Upon receipt of any item in your warehouse, you enter the product, a picture of it, the product’s barcode, and the number of items you are inputting. Then, when a technician removes an item from your warehouse and places it in his service vehicle, FieldSurf makes a note of that. You always know exactly how much inventory is in your warehouse and how many items each of your technicians has in his vehicle. When your tech sells an item to your customer, FieldSurf records it in the Work Order and the Invoice for that ticket, notes that the item has been sold, tells you who it has been sold to, and deducts that item from the number you have on hand in both your warehouse and your techs’ trucks. There’s nothing like it. When you get down to a certain predetermined level of product, FieldSurf alerts you that you have reached this critical number and advises you to reorder. With FieldSurf, you never run out of product so you don’t lose that sale. And all your Inventory reports generated for you by FieldSurf are in real time: it will even include any sales you might have made that very day. Another headache that is removed when you start using FieldSurf is your payroll calculation. One of FieldSurf’s major features is that it has an integrated time-clock. Your technicians use FieldSurf to log in and out of each working day. They also log into FieldSurf to document their arrival time at your customer’s location, as well as their departure time on completion of that assignment. That means that with a single click, your dispatcher or any of your management team can always calculate hours worked and payroll due. This information is available to you and your staff in real time. You always know exactly where you stand, how much payroll is due at the next pay period, and you can compare your current payroll figures to those from any previous period, so you always know how you’re doing. 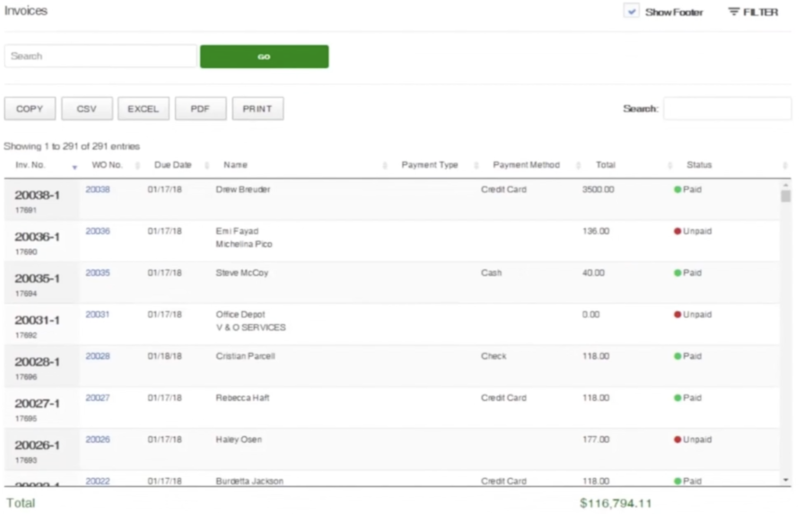 Another superb feature of FieldSurf is the way is totally automates your accounting & reporting functions. Every sale, every job, every part used, every hour worked, is automatically calculated by FieldSurf from data in the Work Order and your Invoice to the customer. At any time, you can access your financial data and get reports — in real time — about every financial aspect of your business. You can instantly access your company’s sales for any period – the current week, month or year. And you can compare those sales figures with those of any other period. You can use FieldSurf to tell you which of your technicians are doing well and which might need some support and encouragement. FieldSurf calculates the costs incurred on each job, including hours and parts used, and will tell you exactly how much money you are making on each job you bill. And of course, the system will also let you know when and where you might be losing money. There’s nothing like field service management software to grow your service business. And no system on the market today offers as many vital management features as FieldSurf. It is 100% Internet-based, easy to learn and easy to use. Just register your company and your techs, and you can be up and running on the first day. FieldSurf is accessible from any desktop computer, any tablet computer, and even from your smartphone — so you can access FieldSurf from any location. No more waiting for financial reports. You, or your accounting department can generate a huge number of important financial reports about the state of your business. And it’s all in real time. There’s nothing like FieldSurf to grow your service business.